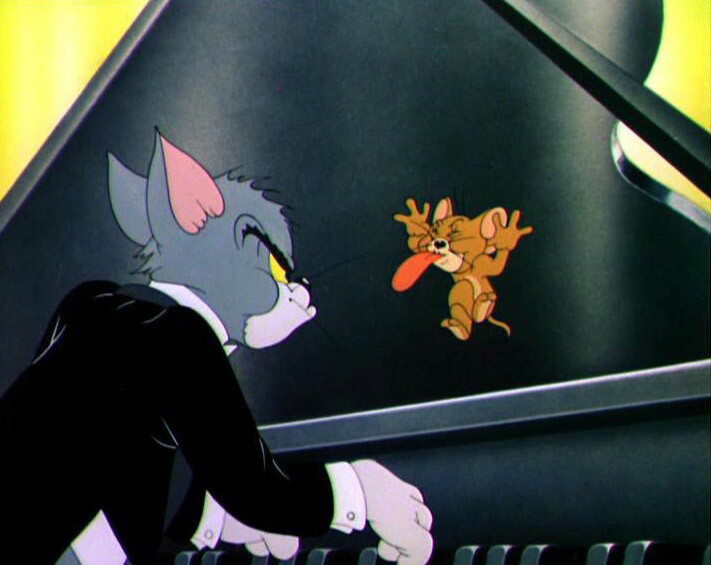 In ‘The Cat Concerto’ Tom unexpectedly appears to be a star pianist, playing Franz Liszt’s second rhapsody in concert, and doing it with enjoyable flair. Unfortunately his playing awakes Jerry, who sleeps inside the grand piano. This leads to a hilarious chase in and around the piano, while the playing of the music continues. ‘The Cat Concerto’ almost looks like a remake of Friz Freleng’s ‘Rhapsody Rabbit‘ from 1946. However, it shares only two gags with the earlier film: that of the mouse suddenly interjecting a boogie-woogie theme and the final gag in which the mouse steals the show. The main difference between the two films is The Cat Concerto’s higher sense of realism and its integrated story, in which every gag follows from the one preceding it in almost continuous action. ‘Rhapsody Rabbit’, in contrast, is more absurd and contains more totally unrelated black-out gags. In the end, ‘The Cat Concerto’ is the better cartoon, because of its great characterization, its outstanding animation, its perfect timing. Indeed, it won an Academy Award, and together with ‘The Band Concert‘ (1935) it can be considered the best concert cartoon of all time. Nevertheless, there seems to be something fishy about ‘The Cat Concerto’, when compared with ‘Rhapsody Rabbit’. For more on the controversy about these two all too similar cartoons, see Thad Komorowski’s excellent blogpost on the issue.